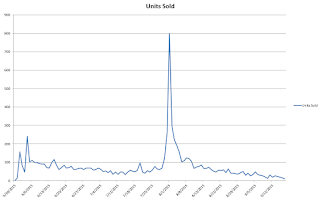 Pretentious Title: Let's Talk Numbers: Do Pre-orders Help Sales? Nice Dragons Finish Last was selected to be part of the Kindle Big Deal in June. This was a surprise for us. We knew we were a candidate, but Amazon didn't formally tell us we'd made it in until about a week before the sale started. OGDDA was almost ready for publication at this point, and Rachel had a great idea that made us work like crazy for 3-4 days. 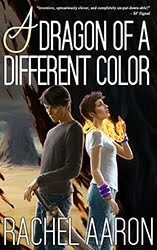 She updated the back matter for Nice Dragons Finish Last to have sample chapters of OGDDA, followed by a link to the pre-order. Just in time for the Kindle Big Deal to hit. A link to rachelaaron.net for more books (and to sign up for our mailing list). A page with pre-order info at the end of the sample chapters. This combination worked far and beyond our wildest expectations. I'm sure a lot of existing fans jumped on board when the pre-orders opened up. Still, since the OGDDA pre-orders greatly eclipsed expected sales, I feel that's a strong indicator that many of those pre-orders were new readers who came into the series during the Big Deal, got excited by the sample chapter at the end of NDFL, and clicked the pre-order link. The Kindle Big Deal is a fantastic way to sell books, but its not something we control. Amazon decides whom it wants to invite and when. That's okay though, because this technique we used of unveiling and promoting pre-orders for a sequel in the back of your previous books (when readers are the most pumped about continuing the story) can work in conjunction with any sale or promo you manage to line up. Put new book on pre-order 2 months before it comes out. Line up a $.99 sale and related promo for the book/books that come before it. Make sure the promo books promote the pre-order in their back matter. How will this work for book 3+ in a series? I'm not sure, TBH. We'll have to get creative. Rest assured that when we tackle this, you all will hear about it here! Enough about this though, let's get back to sales numbers. Specifically, our rank over time. Like I said, the Kindle Big Deal was amazing. 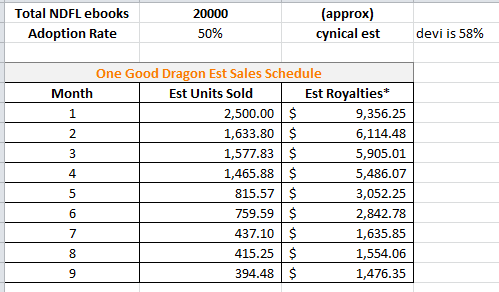 It started on June 1st for Nice Dragons, which you can easily see in that massive leap up in sales rank. What's highly unusual is how long it stayed up there. You see September's downward slope? That should have happened in July once the sale ended. But it didn't. And it's not just rank, either. 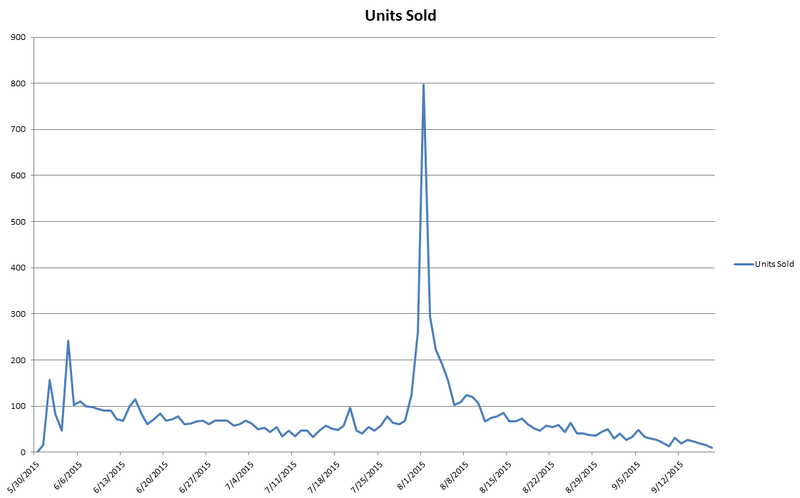 Take a look at this chart, which tracks our sales volume. Furthermore, we have higher regular sales in July as well. As I said above, we should have started seeing a drop here. Instead, it stayed level for 2 whole months. August was a release month, which are always good for sales across all titles, but July was all on its own. So why are these numbers so high? Initially, we thought the change to KU might be helping uS (since we are benefiting enormously under the new KU system), but those changes were just on the author side. 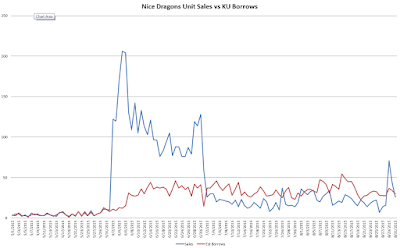 The KU reader experience and the way Amazon uses KU borrows to boost sales rank (1 borrow = 1 sale) are still the same as before. 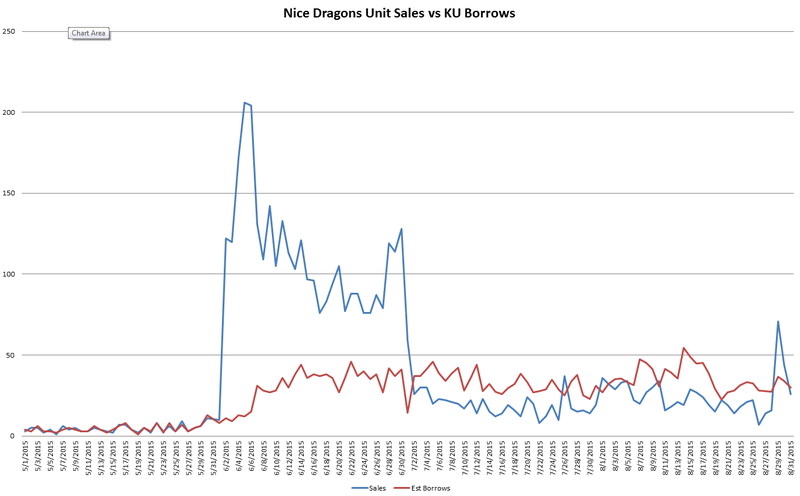 So, with KU out of the picture, our best guess to explain this increase in volume is pre-orders. We had 2200 preorders for OGDDA in July. That's a good sales month by any accounting, and it corresponded with a commensurately high (or I should say low, but you know what I mean) average sales rank for OGDDA, even though that book hadn't released yet. It's very well known that a good Amazon sales rank brings a lot of visibility, and since OGDDA is very clearly the second book in a series, our best guess is that a lot of those potential readers who saw OGDDA on their screens and got hooked by the cover and blurb went off in search of the first book in the series, resulting in continued high sales for NDFL, even though it was no longer on sale or even being promoted. This was made even easier by the fact that both books were in KU, making the cost of starting the series effectively nothing. Even better, many of these same new readers probably finished NDFL that same month and then went on to read (or at least buy/borrow) OGDDA, thus adding their clicks to the sales rank of both books! And if you think I'm overestimating the impact of KU on sales rank, take a look at this. 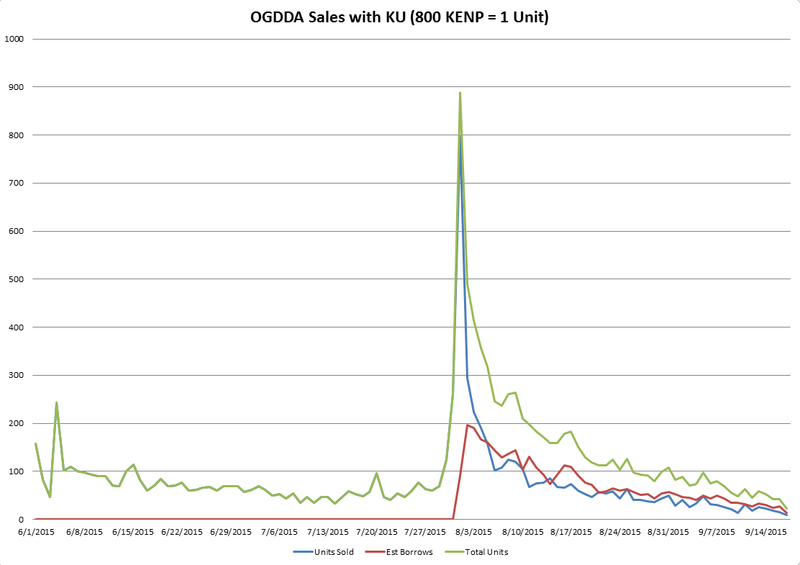 We see here that KENP makes up half or more of OGDDA's sales volume. Release day being the exception of course. The relationship there seems to be closer to what we see with Nice Dragons. I bet that, going forward, OGDDA will have almost exactly the same sales to borrows ratio as NDFL has. Consider that KU borrows directly contribute to Sales Rank and I think we can all see just how powerful and important KU is. I mean, ~60% of our sales rank for these two books comes from KU, not from sales. Like it or hate it, KU is a powerful competitive edge on the world's strongest ebook market (and a very profitable one for long books that people read all the way to the end). Ignore it at your own peril. Moving on, we have one interesting event left to look at before we're done here today. What's up with September? Sure a chunk of these are estimated sales since September isn't over yet, but that's still an enormous drop-off! It also falls under my previous Month 2 prediction in the table at the top of the post. How do I account for this? 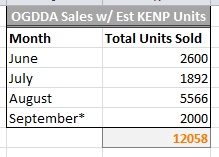 Again, September's numbers are a best guess projection of sales since the month is not over yet, but this still shows us something fascinating. For our previous launches, Month 2's volume tends to be 45-65% of Month 1's. 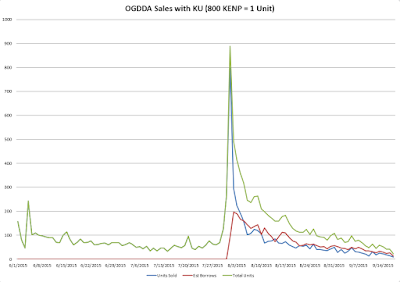 We weren't seeing this on the sales chart above, but once KENP is converted to books, we see that the effective units moved (borrows + sales) once again lines up as expected at that 45-65% of Month 1 number. So where'd all the Month 2 readers go? Did they get poached by pre-orders? Did they just lose interest? Thankfully for us, the answer is no. They didn't suddenly stop buying in September, they were all just reading the book in Kindle Unlimited. Mystery solved! I'm gonna stop here. I could talk about numbers all day and all night, but I think I've made my point. My take away from all this is that we scored big leveraging the Big Deal and brought in a lot of new readers to the Heartstrikers series. We also scored big and kept our readership high by going whole hog with both titles into KU 2.0, even when we only had guesses as to how much the new KU system would pay out. It was a smart risk and, for us at least, it payed off tremendously. I hope that I've provided you with an interesting glimpse into our experience with pre-orders and how they change sales volume! If you have any questions, or if your experiences with pre-orders are different than ours, please let us know in the comments. To see more numbers and publishing business articles, click on the Business tag at the bottom of this post. If you want new posts as soon as they're up, follow Rachel on the social media of your choice (Twitter, Facebook,Tumblr, Google+) or subscribe directly to the blog via Feed Burner. Do those numbers include the audio listener ore-orders also? A lot of this looks like it hinged on that daily deal. I've heard people mostly complain that Amazon preorders don't count on the release date, thus nerfing your rank. However, over at Joanna Penn's blog today, her guest was talking about how preorders on ALL other platforms count toward your first day rank. 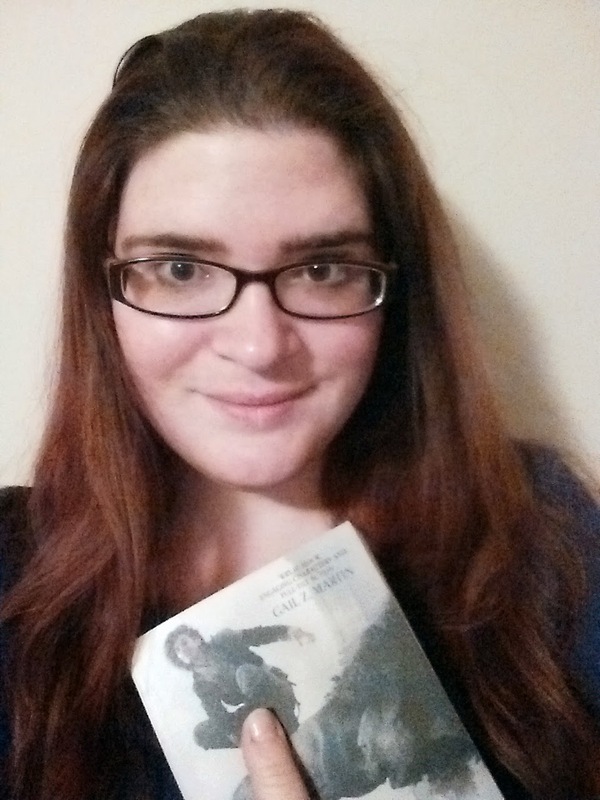 Your books are amazing, and I'm so glad to see you having such great success! I imagine as you keep adding more Heartstriker books, those numbers are going to keep climbing. No they don't, as we only get quarterly statements. It's almost impossible to do this kind of analysis including audio. Thanks for another great numbers blog! These are super helpful and inspirational. It would be nice if Amazon let pre-orders count on the first day. The point I was trying to make here is that, while we didn't get that bonus, we weren't penalized by lower first-day sales either. There is an opportunity cost there of course, but IMO no other vendor has an offer so good as what we're getting from KU. We came out ahead, opportunity costs included, in the end. Thank you for another numbers post! There are especially useful for me, since I am just starting to self-publish. I love all your books (Aaron's, anyway) and all your advice. Your books are much more extreme than I ever write.